Mortal Kombat X is the latest version of the popular fighting game that was successful for several generations and platforms. With competitive and fun gameplay, the title is known for its memorable and brutal fatalities. As well as the older versions, MKX is filled with tributes and games. Now check out the list of Best Easter Eggs of the game. At the beginning of the fights, before the action, the character Cassie Cage removes her headphones to prepare for fights. If you listen very carefully, you can recognize the muffled noise of the soundtrack of Mortal Kombat 3 out of the headphones of Cassie Cage’s MP3 player. The sound is low and can be heard more clearly in the English version. At one point the main campaign, you can notice some posters advertising referencing the Cyrax and Sektor characters, robots that appeared as playable characters in several versions, including the Mortal Kombat 9. To step into the battles, Quan Chi always carries the head of a monster. It is Moloch, one of the heads of Mortal Kombat: Deadly Alliance, which actually fought alongside the character. Ed Boon, creator of the game, always liked to engage in various games with the characters of the game. 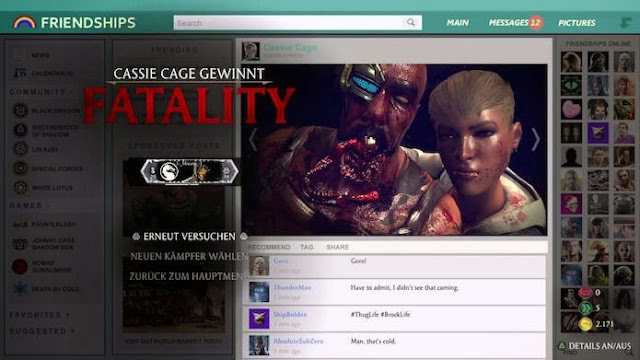 This time, Fatality Cassie Cage where she posts a selfie with the defeated enemy, you can notice Boon tweets, as well as references to several other characters in the series, as the police Stryker. In addition to the powerful guns, the Erron Black character also carries a sword, used in some of the combos and special moves. A more cautious study of the artifact reveals that, in fact, it is the arm of a warrior Takartan the same race Baraka. In one of the most memorable scenes in the film inspired by the game, the giant Goro destroys Jhonny Cage’s sunglasses. During any battle between the characters in Mortal Kombat X , Cage will charge the glasses broken by Goro in a clear reference to the film. When finished Klassic Tower mode with a character, players have access to short films, which can learn more about the fighters. By winning challengers with Cassie Cage, it will be revealed that the daughter of Jhonny Cage with Sonya defeated Shujinko character, which plays an important role in Mortal Kombat: Deception.